After a lawyer urged him not to stick taxpayers with a $5 million recount tab, a federal judge on Wednesday dissolved his earlier decision and halted the hand recount of 4.8 million ballots that were cast for president in Michigan. The issue, however, is far from over, as an appeal will follow. The Michigan Republican Party and Michigan Attorney General's Office argued it was not, stressing a state appellate court had already decided the issue and that Goldsmith should respect that 3-0 decision and halt the recount, which started Monday under an order from Goldsmith. The Michigan Court of Appeals ruled that Green Party candidate Jill Stein has no standing to seek a recount because she has no chance of winning. She came in fourth place, with 1% of the vote. But attorneys for Stein argued the recount must continue, stressing that thus far it has shown numerous voting problems across the state, particularly in Detroit, where more than half of the precincts' ballots cannot be recounted due to problems that have not been disclosed. They also argued that Stein is an aggrieved party if she participated in an election that was plagued with mistakes or fraud. And the voters of Michigan have a right to know that, too, they said. After the hearing, Stein told the Detroit Free Press that so far, the recount appears to be exposing problems with Michigan's election process, particularly in low-income, minority communities. "It is revealing some really troubling aspects of how elections are run here," Horowitz said of the recount. "We think that's part of the reason the recount should continue — to continue revealing those problems so that the people of Michigan can see how their election operates." 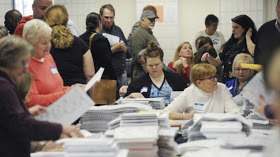 Recount opponents argue that that's not what Michigan's recount law was intended for. Rather, it was meant to help an aggrieved candidate change the outcome of an election, not to see if there is a problem, they argue. "Her entire purpose is to audit the Michigan system," John Bursh, of the Michigan Attorney General's Office, said of Stein in court. He urged the judge numerous times to halt the recount and not stick Michigan taxpayers with a potentially $5 million recount tab for a candidate who has no chance of winning. "Don't become the first federal court in the country to order a recount ... for a candidate who lost by 2 million votes," Bursh said. "This candidate is not aggrieved in any sense of the word," Gordon said of Stein, stressing: "It's very unlikely that 2 million mistakes have been made."